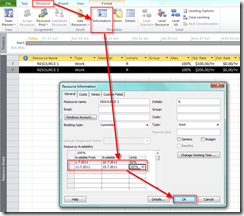 In this blog I will demonstrate how can you set up different resource Availability to the same resource in MS PROJECT 2010. I will repeat “setup” from my previous blog. First I will add two tasks. 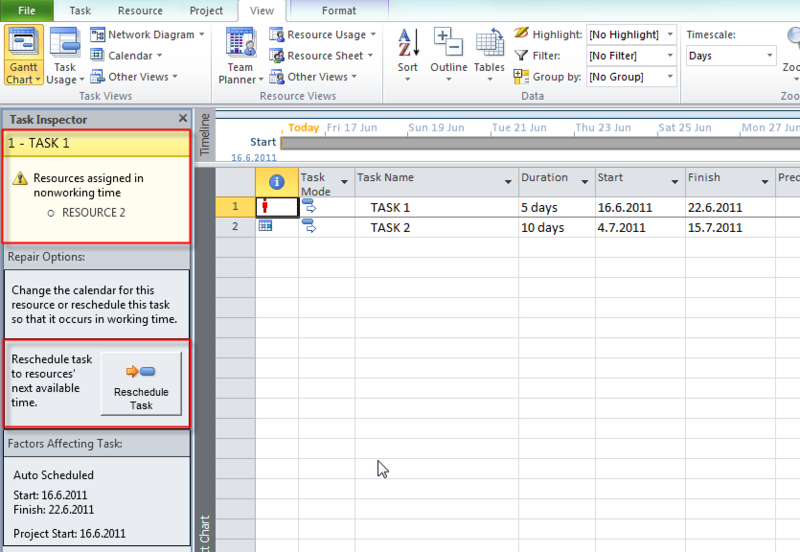 TASK 1 will have 5 days duration and it will start at 16.06.2011 and it will finish at 22.06.2011. 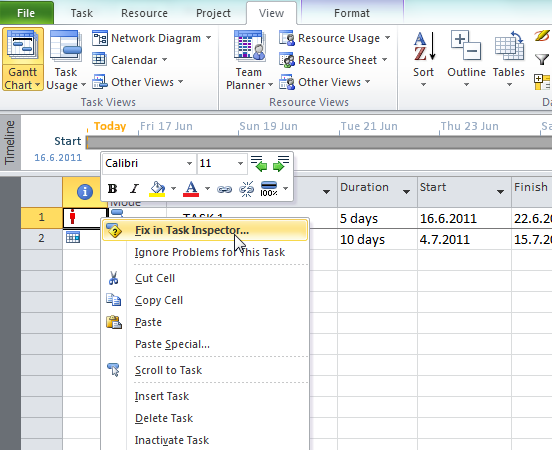 TASK 2 will have 10 days duration and it will start at 04.07.2011 and it will finish at 15.07.2011. That means that RESOURCE 2 will be available only from 01.07.2011 to 15.06.2011 and he will work part time job (4 hours) from 01.07.2011 to 10.07.2011, and full time job from 11.07.2011 to 20.06.2011. RESURCE 2 is available from 01.07.2011 to 10.07.2011 with 50% units (availability), and from 11.07.2011 to 15.07.2011 with 100% units (availability), remember? 01.07.2011 –> 4 hours + 04.07.2011 –> 4 hours + 05.07.2011 –> 4 hours + 06.07.2011 –> 4 hours + 07.07.2011 –> 4 hours + 08.07.2011 –> 4 hours + 11.07.2011 –> 8 hours + 12.07.2011 –> 8 hours = 40 hours! 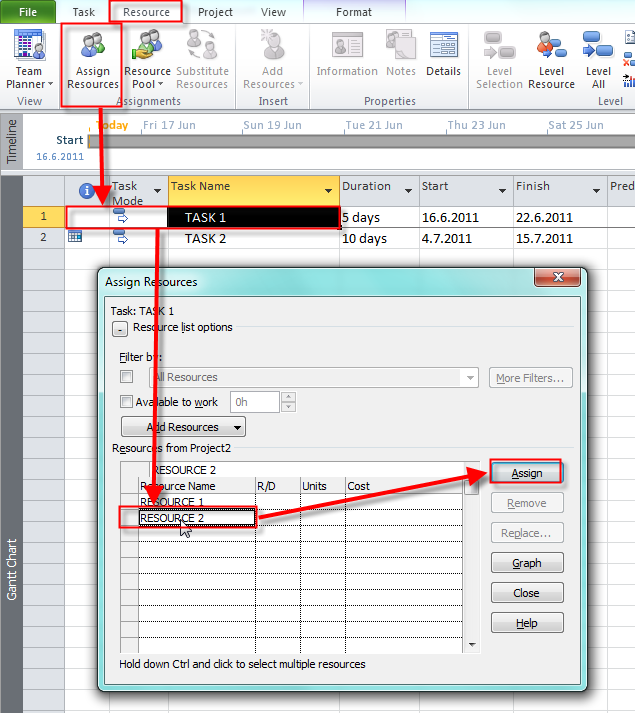 If you were following my example you can try it with TASK “2 and RESOURCE 2. For the end, be EXTREMELLY CAREFULL when you are using different availability for the resources, because you can get in the trouble if you are not 100% sure what are you doing. 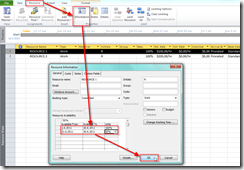 This entry was posted in MICROSOFT PROJECT, Microsoft PRoject 2010, MS PROJECT 2010, PMI, PRoject Management and tagged Microsoft Project 2010, MS PROJECT, MS PROJECT 2010, MS PROJECT 2010 - Setting Up Resource Availability. Bookmark the permalink.